Chimney Problems? 1st Choice Chimney Has The Answers! If you think you may have a problem or concern with your chimney or fireplace, or maybe you just want to ensure that you DON’T have any chimney problems… here are a few common issues along with helpful solutions to help get and keep your fireplace free of problems! There are several forms of creosote, they are all dangerous because they are flammable and can cause chimney fires. Every year, many thousands of house fires are caused because of dirty chimneys which haven’t been properly maintained. 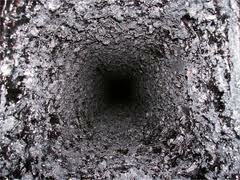 Creosote can also prevent proper venting of the chimney system, causing dangerous fumes to enter the home. An obstructed chimney is one of the reasons carbon monoxide can invade a household. Known as the “silent killer,” carbon monoxide in large amounts is deadly; it is odorless, tasteless, and invisible. During a chimney cleaning, our professional chimney sweeps use just the right tools to remove creosote from the flue lining. There are three types of creosote, and we have the tools and equipment to remove even the toughest flammable deposits from the flue lining. There are many forms of blockage besides creosote. One of the most dangerous situations with chimneys is when a fireplace hasn’t been used in a long time and causes a blockage. It could be caused by a bird’s nest, leaves and other debris, or even masonry (brick and mortar) if a chimney has deteriorated over time. 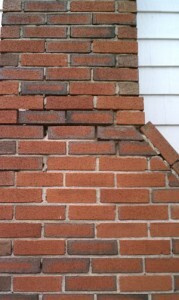 The simplest way to fix this, is to have us come out and check for any blockage and remove correctly if so. When fireplaces are initially built, usually a chimney lining is included. The most economical and common type of lining is clay tile. Stainless steel lining, which virtually never has to be replaced, may be an option for you for it’s high durability. 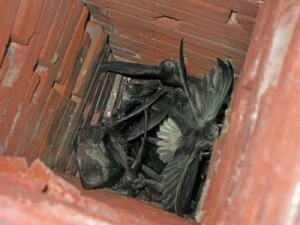 You should be aware that chimney linings are subjected to a lot of heat and stress and they can often become damaged. 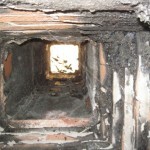 A damaged flue is dangerous, and a fireplace should not be used until the lining is replaced. When there are cracks, the heat from the fire can reach combustible parts of the home and start a house fire. In addition, it could expose the household to dangerous gases like carbon monoxide. When mortar deteriorates, the masonry/brick and entire chimney system is exposed to moisture and other concerns which leads to brickwork problems. The best way to keep brickwork in good shape is to keep moisture out, which means that sometimes mortar has to be replaced. The first lines of defense against harsh outdoor elements is the chimney cap or topper . If this is damaged, moisture could enter your chimney and wreak all kinds of havoc causing your chimney to be unsafe for use. Also, a chimney without a cap (or a faulty cap), can allow all kinds of unwanted critter into your chimney, fireplace, and even interior of your home! We recommend having the chimney cap looked at yearly, along with an annual maintenance program for your chimney and fireplace to help prevent any issues from occurring, or fixing any current problems.